You will arrive at Langkawi airport and transfer to your hotel for overnight stay. You can hop onto the cable car to experience a panorama of lush hills, beaches and islands at a distance. The highlight of our Langkawi tour packages from India is the round island tour where we take you to see the traditional wooden Bon Ton Kampung Houses, be a part of the legend that is a battle ground between mythical birds Garuda and Jentayu at the black sand beach. Part of this Langkawi city tour, you will also visit an art and cultural centre showcasing detailed handmade designs of Malaysian batik on display. You can try your hand at batik making. Make a quick stop at the Eagle Square which has a marvellous eagle statue in flight facing the coastline. You have the day at leisure. You can do some shopping or take the optional Sunset Dinner Cruise. Reminisce your worry-free Langkawi trip package as you board a flight for Kuala Lumpur after breakfast. Arrive and check-in at the hotel. You will head out for a tour and take photo stops at the King Palace, National Monument, National Mosque and marvel at the beautiful Independence Square. Check-out and transfer to the airport for your onward flight. Langkawi is an island destination part of an archipelago of 99 islands along the Andaman Sea. Imagine azure beaches, an alluring countryside strewn with paddy fields and wonderful flora and fauna. The exotic wildlife can be witnessed through a Langkawi tour package taking you to Kilim Karst Geoforest Park, Datai Bay and other areas. You will be left spellbound with different calls of the wild or amazed by the bat colonies part of ancient limestone caves. 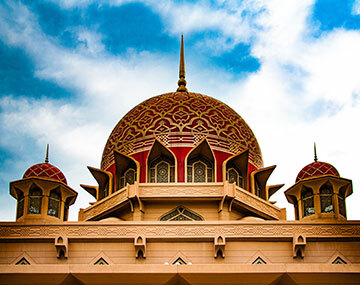 The capital city of Malaysia, Kuala Lumpur has held on to its rich heritage and culture along with technology. Its skyline is dotted with iconic skyscrapers. Petronas, the tallest Twin Towers in the world is a must-visit. It offers a bird’s eye view from its Observation Deck. Learn about the natural history of Batu Caves with cave temples and shrines. Our Langkawi packages from India will provide you with a solid, well-planned vacation. Once you take the Langkawi packages from Delhi or other major cities, we will cover all major attractions. We have allotted ample time at leisure so you can shop for souvenirs with our Langkawi city tour package or try the delicious seafood options. You will be able to enjoy water sports with a Langkawi island tour package and make the most of your visit. Our package will help you witness the frenzy which is Kuala Lumpur. The pulsating nightlife with some of the best street food options you can find in Asia can taste at Kuala Lumpur.